Mike Johnston is without doubt one of the most skillful and infectious teachers in the drum game today. 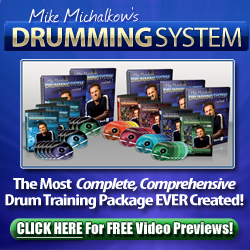 From his high-tech studio in Sacramento, CA he inspires drummers throughout the world with video lessons that have attracted millions of views. How did you get into drumming in the first place Mike? From there my parents got me a drumset and I started taking private lessons when I was 6 – I was horrible for many years but I didn’t mind because I just loved playing. So, It was a kind of school band accident that got me started. You were a touring drummer for a few years, when and why did you make the shift to education? Well, I was teaching first. I started teaching when I was 17 at a music store called Drum & Guitar City. I ended up getting a record deal when I was 21 and had to leave teaching to go on tour. My parents said, ‘Look, you might never have this opportunity again.’ It was a big, major label multi-million dollar record deal and so I was like ‘OK!’ and did it. I wasn’t really that into it. I never wanted to be a rock star. We went out on tour and opened for every major band, you know, Limp Bizkit, Korn, Blink 182, all that kind of stuff. The whole time I’d be on stage playing to say 20,000 people all I could think about was getting off stage and teaching the other drummers what I just thought about. I was like, ‘I can’t wait to get done with this stupid show so I can show Travis Barker this new lick I just figured out in my head.’ And so after about 5 years of that I realized, man this is a lot of people’s dreams, but it’s not my dream. My dream is to help people get closer to their dreams. I like explaining things more than anything so I gave it all up and I’ve been turning down tours ever since. When you put up your first youtube videos did you expect things to blow up the way they did? (…laughs) Dude, have you seen them? There terrible! I had no idea. I didn’t think anybody would ever watch them. At the time YouTube was a new website and because I was doing little short tours I’d put up those videos for my private students to watch while I was away. It just kept blowing up and blowing up and then all of a sudden I was like ‘This things got almost a million views!’ So, I wasn’t expecting it at all but I definitely embraced it. You are a phenomenal player, what kind of practice routine have you followed to get to that level? I got lucky in that the bar is set very high here. I live in a small town called Sacramento in California and the level is very, very intense. So, to me it was very normal to practice four to five hours a day. That was the minimum and I felt guilty If I only got four hours in. That was the norm so I didn’t know that I was doing anything extra curricular – It was just like 4 hours a day from the time I was 6 till the time I was touring. So, I always made friends with drummers, especially if they were better than me. That’s who I really wanted to be friends with. I didn’t want to dominate anybody, I always wanted to feel like I was in last place trying to keep up. I think it was more drive than anything else. I’ve also taken private lessons from the time I was 6 right up until today – I still take lessons. I’ve never stopped, I just switch teachers, obviously. Even when I was touring, as soon as we got into town, no matter what town I was in, I’d have a cab take me to the local music store and I would say I’d pay double if the teacher could fit me in on the particular day for one lesson. I figured that no matter who he/she was or how good he/she was they knew something that I didn’t so if I could pick up something then that was great. Do you have any advice for other drummer/educators who would like to follow in your footsteps and build a successful business? I think the one thing that made it successful is that it came from passion rather than for the money. It wasn’t even a business. I didn’t think I’d even have to pay taxes on it, you know – It was nothing! But, I was trying to help drummers. To be successful in business, if you are the client, you’re gonna do really well. You know what the client wants because you are the client. A lot of things I do are things I wish Dave Weckl, Virgil Donati, and Vinnie Colaiuta, would have done for me. I was searching for live online lessons from Dave Weckl and when I, the client couldn’t find those things I made them myself. So, I think that helps. If you are always doing it from the right place then your gonna do pretty good. What are your top 3 albums, concert dvd’s and drum books? Top three books would be Future Sounds by David Garibaldi, Basic Drumming by Joel Rothman and Linear Drumming by Mike Johnston – it’s just a phenomenal book, he’s just a great educator and he really gets to the core of it (…laughs). Actually as goofy as it sounds that book is a collection of all the things I wanted to find in books that I never could find. Once again, I was the client and I wrote the book that I wanted. Concert DvD’s would be, But Seriously by Phil Collins, When In Rome by Genesis – I’m a huge Phil Collins and Genesis freak – and the newest Sara Bareilles concert. I’m watching that DvD non stop. I don’t know her drummers name but I do know her whole band was hired through her first audition. She didn’t know enough to hire good musicians so whoever came in first got it – and they are actually a great band. Albums, Slip by Quick Sand, Waters and Solutions by Far, and Around The Fur. I like rock. You are now offering week long camps. Can you tell us what people can expect when they visit? My main thing was, I don’t want the Kobe Bryant Basketball Camp or the Wayne Rooney Soccer Camp where it’s a hundred kids and he shows up for five minutes, pats them on the back and then leaves. I wanted to make sure I had a super connection with these cats. So, It’s a week long, it’s only 8 people but we do them all the time so you don’t have to worry if you didn’t get in because there’s one the next week and another the next week. Each day is it’s own subject so Day 1 is Speed, Day 2 is Independence, Day 3 is World Rhythms, Day 4 is Branding and Self-Promotion. We have a whole day talking about this – no matter what you want to do with drums, how do you achieve those goals? Let’s figure it out. You wanna be the biggest drummer in your town? Let’s write out a roadmap for that goal and let’s nail it, you know. You want to be a touring drummer? Let’s figure it out. Day 5 Linear. Day 6 we do Groove & Feel working on how to make a song feel good rather than just a bunch of chops and then Day 7 we have a review day. What’s next for you and Mikelessons.com? I’m letting the cat out of the bag here, but I think it’s worth it. The next thing we’re going to start doing is live online drum clinics with famous drummers. I’m gonna fly in Bennie Greb, Will Kennedy, Todd Sucherman, and other drummers of that calibre and we’re gonna broadcast a live two hour drum clinic. It’ll be like a normal drum clinic but we don’t have to come to your anymore, you can come to us online. I’ll do one hour and then Benny will do one hour and it’ll be a really cheap pay per view kind of thing – I’m thinking $4.99. There will be a chat screen in the room so you’ll get to ask them questions and interact with us. We’re setting up the infrastructure right now so we can handle 2-3000 viewers at once all asking questions and that kind of stuff. It’s gonna be pretty chaotic but that’s our next step. Yes definitely… don’t be scared of the other drummers in your town. If they’re better than you then you have something to learn from them, If your better than them then you have something to teach them. Make a community because you’ll get better so much faster and you’ll learn more about gear than you ever thought you could because they read this magazine and know about this peddle that you’ve never heard of. You’ll grow as a community if you just stop competing and start playing together.